It’s Fall! For Lisa Tenley, Forrester Construction‘s human resources manager who runs the company’s internship program, that means way more than sweaters, football and pumpkin. It means it’s time to hit the road visiting top universities, attending college career fairs and interviewing for construction field operations internships. For many college students, the appeal of a great internship program is clear. On-the-job experience gives grads a leg up with employers and can make their resume rise to the top of the stack. 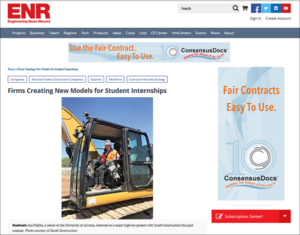 But, as a recent Engineering News-Record article pointed out, many construction firms are creating new models for their internships because well-developed programs have proven to be mutually beneficial for both the student and the company. “While the benefits of internships are clear for students, they also are tremendously beneficial to employers. In fact, the more engaging and meaningful a student’s internship is, the greater the return on investment for businesses. Students who had an enriching experience return to their universities and share that positivity with their faculty, advisors, and peers,” Tenley says. 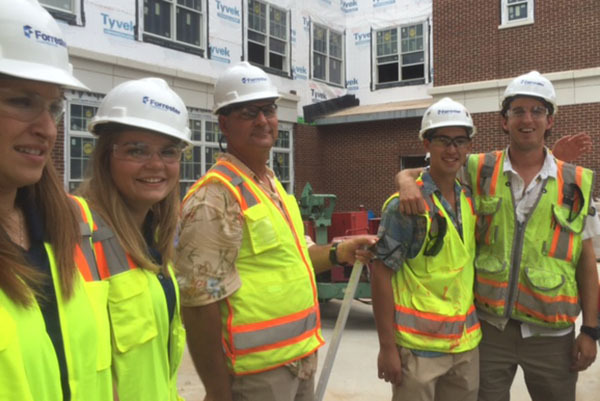 Forrester’s Internship Program concludes with each student leading others on a site tour of their project. It is a chance for them to share what they have learned and learn from each other. Even when interns choose to pursue other opportunities after interning with Forrester, they can be powerful campus ambassadors. With many years of experience working for and with colleges and universities, Tenley notes that word of mouth is powerful, and positive comments to faculty, other students and advisors can lead to a better pool of candidates in the future. 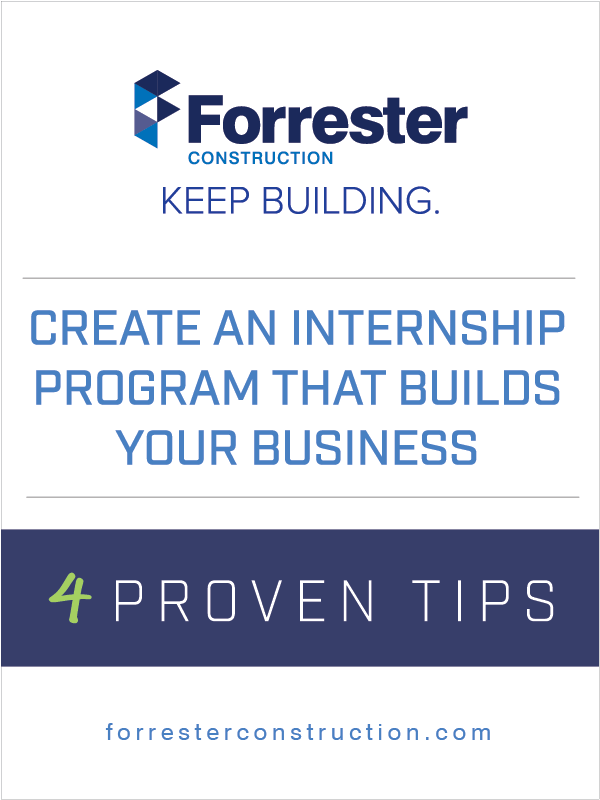 Forrester’s construction internship program and entry-level field engineer roles are continually evolving and improving, seeking new ways to engage interns. Tenley explains Forrester’s general contractor internship program approach for developing future great builders: broaden their exposure to construction by pairing them with great mentors on interesting projects, give them opportunities to “own” their responsibilities and integrate them into the company culture. Keep it small! You can better monitor the experience of each intern, carefully vet the sites and teams, and provide a more meaningful experience for students by keeping the group selective. Help craft a summer construction internship program that is personal and can help each intern feel like a vital part of their project team. Work closely with partner schools to get to know students and build relationships that feed your program. Finally, play to your company’s strengths and craft a program that reflects your culture – the bottom line is that your internship is an extended audition for a full-time position and both the company and the student need to determine fit accurately to maximize your ROI. 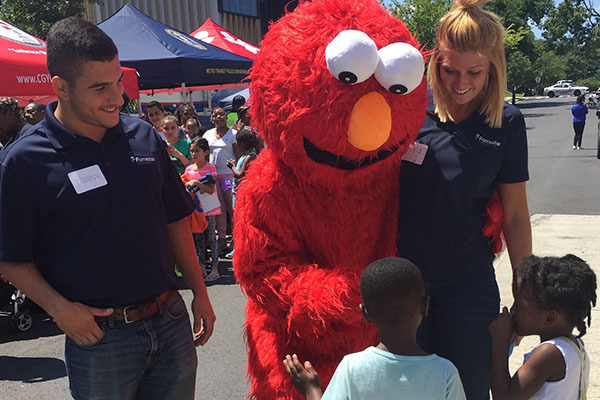 Forrester Interns participate in company-wide events and programs including community outreach and volunteering. See the full ENR article and learn how Forrester and other industry-leading construction companies are reshaping student internships.